One of the smartest articles written to date about airport security. Written by a.... commercial airline pilot. If you're Canadian and appreciate your consumer rights, you need to watch this video. In the last year we lost a restaurant that has been hit or miss - Luciano's. The chain was replaced by a new one - Redwater Grill. Another upscale entry in the market. The menu we saw online didn't really inspire us, but I finally convinced Darlene that we should check it out, especially since one of them is just a 3 minute drive from our house. The decor is typical of new restaurants - lots of muted, dark colours and focused lighting. But on to the food. I ordered the Italian bacon and cheese gourmet pizza. It was very tasty. But Darlene's chicken fettuccine alfredo was awful. She said "Lipton Sidekicks would be better than this." I had to taste for myself and I agreed. It was tasteless, the sauce watery and flat. The pasta was undercooked. What a shame. For a gourmet restaurant, they were a perilous 1 for 2. We haven't completely given up on this new place, but our next visit will have to be perfect for them to see us through their doors again. In this period of celebration and festive... ness, it's always a good idea to remind our friends to beware the dangers of drinking and blogging. Blogging 41 months (and counting) sober. Here's yet another electric car that may make headlines soon - the Aptera. It kinda looks like a small plane with the wings missing. I traded up. I bought the Garmin Nuvi 760. Same basic features as the TomTom unit I returned, much higher price. I'll assume for the moment that the extra price translates into better quality and less hassle. Obviously, the thing I was most interested in was the process by which you get map updates. Garmin doesn't rely on web downloads - they offer their map updates via (shipped) DVD or SD card, the SD card option supposedly being more efficient in that the moment it gets inserted into the device, the new map is available (no PC required). That sounds great to me. I was able to make a complete backup of the contents of my Nuvi without any additional software installed, as the Nuvi is seen by the PC as just another USB drive. Although support wasn't very clear with me whether my backup is of any real use, it's still nice to know that if any files get corrupted on my Nuvi, I have backup copies. I will give the departed TomTom one kudo - their interface is better than the Nuvi. The Nuvi doesn't show as much on the map screen while you're driving. 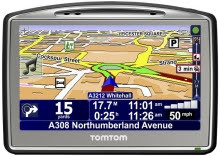 But it does offer a lot of extra information on a separate screen that the TomTom didn't have. I like the Nuvi mount a bit better too. [update] Darlene was impressed by the Nuvi's ability to find the nearest Tim Horton's. 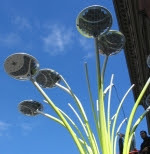 I'm assigning a very high cool factor to this - solar trees. OK, they're actually street lights shaped like trees, with solar panels on top. They're being trialled in Europe (of course), but I would love to see them find their way to our fair city, especially along our many kilometres of bike paths. Go here for the rest of the story and to see what they look like at night. I really miss the small local merchant business model. The model that allows for a store to stock what sells in that market or to stock what customers want versus what a national or global conglomerate wants it to stock. I have seriously lost count of the number of times I've purchased a particular product for years in a row only to discover one day that the product is no longer stocked by a certain big box store (BBS). I long for the return of stores with that personalized touch, which look different from other similar stores and have the ability to stock what they choose. If a particular flavour or variety of a product is selling well, I'd like a store to order more of that flavour or variety, instead of always being sold out but offering dozens of the flavour or variety that doesn't sell. Hey - I like a bargain as much as the next person, but I've gotten tired of walking into BBSs and being able to predict what is on every shelf of every aisle. Worse, I reject the idea that I cannot get a BBS to stock something I'd like to buy. As a consumer I feel like I'm being held hostage. Ever wondered what the most expensive drink at Starbucks is? Wonder no more, my caffeine addicted friends. Someone in New York City received a free Starbucks drink voucher and decided to make the most of their fortune by ordering a 13 shot venti soy hazelnut vanilla cinnamon white mocha with extra white mocha and caramel. That would be worth $13.76 (with tax). Many thanks to my good pal Ernest for the find. While you're waiting for the mall lineups to subside, why not give the latest edition of 'Where Is It?' a try? Guess the city. Click on the image for a bigger view. Good luck, my geohunter friends. Is the mall the right venue for real estate? 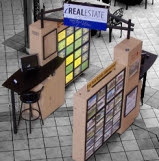 There's a feature in malls (at least where I live) that makes no sense to me - the real estate kiosk. I don't know about you, but when I think about buying or selling a home, I think - head for the mall. Maybe it's just me, but I notice one thing in common about every listing collected at the kiosk - the interior decoration leaves a few things to be desired. Even the listings showcasing acreages with multi-million dollar lovely log cabin-esque properties feature furniture and accoutrements from the 1970s. I may have mentioned this before, but the movie Blade Runner really struck a chord with me and ranks as my favourite movie of all time. So it generated great excitement in the Plesz household when I heard that Ridley Scott was releasing the definitive (and final) version of Blade Runner in 3 editions. The 2 disc edition has the Final Cut version on one disc and the 'making of Blade Runner' documentary on the other. The 4 disc edition adds a disc containing 3 previous versions of the film on one disc and a disc of extra featurettes. The edition I bought is the ultimate collector's edition, which adds a disc with the rare 'work print' version of the movie, a toy model of the 'spinner' flying police car, the unicorn origami figurine I alluded to earlier and a few other little gifts, all inside a tiny silver briefcase. After watching all the discs except for the work print edition, I can say it's a treat for any Blade Runner fan. The final cut brings re-worked video and sound, which just blew me away. No voice-over, a few subtle changes. But the question most fans figured would be answered - is Deckard a replicant? The answer is......... what do you think? If you had told me 3 years ago that there would exist a social networking site where you could, for a dollar, buy tiny pictures of gifts to give to your friends on said social networking site, I would have said, "Gimme a break - nobody would be dumb enough to fall for that crap and actually buy a picture of a gift for someone". But alas it has come true. It's bad enough we've fallen for this overt example of highway robbery, but to make matters worse, they even have the gall to act like some of these 'gifts' are 'limited edition' and are in short supply. Is this what it's come to? Darlene and I have spent the last week or so trying to empty our cupboards by eating all the old, stale, expired food in our cupboards before the Chrisco guy comes to deliver our yearly hamper of food. We would have felt bad if we had to throw anything out, but we had to make room for all that great food that's being delivered. We ate the cheese soup and baking soda and stale crackers and all the other things that have been sitting around for months. I'm kidding of course. That Chrisco ad is incredible - it portrays the most surreal and bizarre reality. The family is painted like folks who just never quite get any of the groceries they like. It's as if the local grocery stores they're stuck with only stock the most awful stuff. 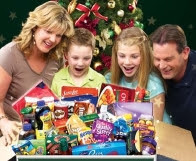 "It's cool having this much food in the house", says the boy in the ad. What? They've never had full cupboards before? This has got to be the stupidest commercial ever. People getting excited about having their pantry filled with food. A holiday wish from me to all my readers. Have a safe and emotionally satisfying holiday. At this time of year, it's always important to focus on the important things. Like 'did I get what I wanted for Christmas, and if not - who's to blame'. But seriously, here's raising a turkey leg to you all. It's not what you think - exactly. You can always count on criminals to do their dumb best. Or is it dumbest? Either way, these stories should elicit a chuckle or two. Merry Christmas everyone. You're probably wondering - where are my gifts? They're online. Courtesy of Lifehacker. Presenting Lifehacker's 2007 guide to free software and webapps. 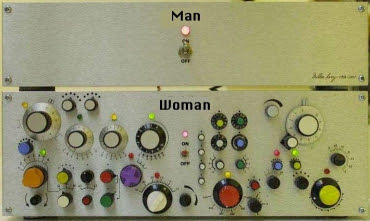 Ahhhh, t'is but a good guide. I know ye well. I promised additional review of my TomTom Go 720, so here it is. One of the things I really enjoy about planning a route, other than being able to reject what was offered and choose alternates is Route Demo. This is where you can watch the thing show a 'drive through' demo (at high speed) of the planned route, so you can familiarize yourself with where you'll be going as opposed to looking down on a map. Speaking of map, I did notice some inaccuracies, but these all involved major road work detours, so it was forgivable. I decided to give the mp3 player feature a try and loaded a couple SD memory cards with mp3s. I was reading a lot of gripes on online forums about the unintuitive-ness of getting music on the TomTom and I see what they mean. You have to use the included PC software as a means of copying the files onto the SD card for it to work 100% guaranteed. OK fine, I'm hip to that. But when I brought the TomTom into the car to try it out, it didn't always boot and instantly recognize the SD card. The FM transmitter built in is a nice feature - one less gadget to carry around - but even with the device cranked to 100% volume, the volume coming through on the radio was quiet and full of noise. This is not good. The TomTom allows you to switch the units of measure to metric. But when the text to voice reads the distance to the next way point, it says 2 miles when it really means 2 kilometres. But alas, all the good things about this TomTom were superseded by a major fault - updates. Oh, they had updates. In fact, I was entitled to a free North America map update for 30 days. The problem was getting it downloaded. This task has to be done via the TomTom Home software. The problem I encountered is that the download (almost 2GB) kept quitting after about 10 minutes. Never at the same spot. No alternative to get the update by another means. TomTom insists it's not their problem, yet online forums would indicate otherwise. To their credit, they tried everything surrounding the Home application itself. I even tried changing computers and unblocking ports on my firewall. But nothing worked. And that's a show stopper my friends. So the mighty TomTom Go 720 is headed back to the store. But its replacement has been spotted. Garmin to the rescue. Have you ever seen anyone do magic with math before? Check out Arthur Benjamin as he races a team of audience members with calculators to calculate 3 digit squares in his head, among other things. Lovely attempt from Ikea to indicate when would be a good time to shop at their store. Looks great, doesn't it? Until you really look at it - then it falls apart. When exactly are you open guys? 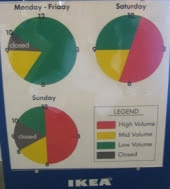 According to the chart, on Saturdays - they never close. I've talked about mashups in the past, and I've paid tribute to the master (IMHO). Now, fans are making videos to go along with Go Home Production's creations. Like this one, 'Supreme Evil'. What's next? Levies on our hard drives? We can use them to store music and movies. What about the internet? Levies on our ISP fee? Will that be next? What happens when writers and publishers ask for a levy on every notebook and sheet of paper because it could potentially be used to store their copyrighted works? Photocopiers should be illegal! Supposedly, the levy on recordable media is the price we pay for the right to be allowed to make private copies. No levy = no deal. Private copying becomes copyright infringement. Has anyone thought about auditing the entertainment industry to see exactly where these levies go that supposedly benefit the artists? We certainly have no proof of where the money is going. 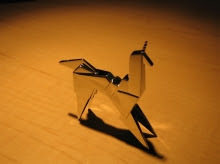 "Too bad she won't live..... "
This is the cute origami unicorn figurine that came in my Blade Runner - The Final Cut box set. I promise - I'll be reviewing the DVDs themselves as soon as I've watched everything. "...other people are going back to XP"
Apple continues to make funny ads taking the piss out of Windows. This poke at Vista is hilarious. Can they build it in time? Every once in a while the subject comes up of a high speed rail line between Edmonton and Calgary. Then it fades away, only to crop up again every 10 years or so. This time, something even more exciting - and plausible, has come up - commuter train service between Calgary and outlying communities like Airdrie, Cochrane, Okotoks and High River. This is a much more viable idea because the infrastructure is more or less already there and let's face it, the feeder roads into our fair city are at capacity already. I hope this is something we don't just study for the next 10 years and actually do what's necessary to make it happen. Bacon must be making a comeback (did it ever really go away? ), because I've been seeing a lot of stuff online about bacon. Yep, I'm still alive - but busier than all heck. What with instructor meetings, volunteering at Loose Moose and assorted holiday something-or-others, blogging has sunk low on my to do list. Never mind that I just bought the 5 DVD ultra-collector-edition Blade Runner Final Cut set. I'm a big fan of clever design and these salt and pepper shakers are definitely unique. You don't shake them, you bend then shake them and the salt or pepper is sprinkled from the gaps between the coils. So, after getting my first taste of GPS navigation in our rental car while I was in the UK back in September, I decided to treat myself to a GPS device for my car. I did a bit of research and settled on the TomTom Go 720. The price was right and I had heard great things about the user interface. Apparently, its biggest weakness is map accuracy - but I'm willing to assume that risk and put that to the test. I was a little nervous about the mounting situation. I have never mounted a device to my windshield before and wasn't very confident that mounting the TomTom there was going to be secure (it might fall off), nor was I convinced it wouldn't interfere with my sight lines. Luckily, this TomTom comes with an adhesive disc for mounting on your dashboard. I just happened to have a perfect spot to locate the disc and the suction cup mount stuck to it like glue. The sight line to the device is perfect - not blocking my view at all - just below the windshield line and not too far over to the right. This made me very happy. The first annoying thing I noticed about the device is that the moment you turn it on for the first time you're supposed to select a language. The problem is that the selection screen disappeared very quickly, leaving me to try and figure out the interface in Spanish. Not good. After looking at the manual I was finally able to switch to English, but I foresee this freaking some people out that aren't paying attention. The next thing I did was try to set up the TomTom as a hands-free phone device. I had heard you could do it with my cell phone model. It works like a charm - the TomTom even captured my cell phone's phone book. So now, when both the cell phone and the TomTom are on, all phone controls are routed through the TomTom. Quality was decent too. I decided to break in the TomTom with a journey to an address deep in a maze of streets in one of the most confusing neighbourhoods in our city - Huntington. It did a great job. The turn by turn voice directions were bang on, with plenty of warning about upcoming turns. Darlene was impressed. It also found a bizarre albeit quick way out of the area to our next destination. One of the things I like about this device is that once it has planned your trip and shown you the overall route on a large scale, you have the ability to reject the route and it will offer alternatives. Another feature I like is that if you decide to deviate from the planned route, it instantly plans a new route based on the deviation. In some cases I was curious about the route it chose, but I'll be damned if it didn't sometimes pick efficient ways to get to familiar destinations. I'll post more on the TomTom in a few days or so. The 12 Days of Christmas like you've never heard before - with a twist. 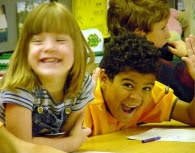 This photo caught my eye on another blog. "I know both my parents"
So last night I ushered at Loose Moose again, but they're not doing their normal show these days. The current performance is 'A ChrisMoose Carol' and it's a take off you know what. I won't tell you this year's theme, but I will tell you that you have to go see this show if you can. It's been playing all month but there are only 3 shows left - this coming Thursday, Friday and Saturday nights at 8pm. Tickets are pretty much selling out in advance, so don't just show up expecting seats. It's one of the funniest shows I've ever seen. A charity in the UK was told by a Performing Rights Society officer that they needed a licence for staff to listen to a radio in the kitchen. Next, they were stunned to be told their annual carol concert would be taken into account when the cost of their licence was calculated. Last year they were handed a bill of £230 ($476CAD) – which they paid by holding a raffle. The future of fund-raising shows was put in doubt after the PRS demanded £470 ($973CAD)this year. They were told the only way to avoid paying to sing the carols is if the kids were told to sing old songs which are out of copyright. 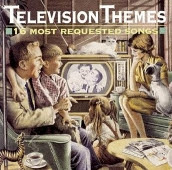 Do you like TV theme music? You can even play a 'name that theme' game! How much further can you go? How far can your car go after the gas light has turned on? Tank on empty aims to find out. You can view submitted statistics for your car's make and model or submit your own values. A man in Chicago calls his son in New York the day before Christmas and says, "I hate to ruin Christmas this year, but I have to tell you that your mother and I are divorcing; forty-five years of misery is enough." "Pop, what are you talking about?" the son screams. "We can't stand the sight of each other any longer," the father says. "We're sick of each other, and I'm sick of talking about this, so you call your sister in Atlanta and tell her." She calls Chicago immediately, and screams at her father, "You are NOT getting divorced. Don't do a single thing until I get there. I'm calling my brother back and we'll both be there tomorrow. Until then, don't do a thing, DO YOU HEAR ME?" and hangs up. The old man hangs up his phone and turns to his wife. "Okay," he says, "they're coming for Christmas and paying their own way." Pass this joke on, and give credit to the blog where you found it. Let's see if we can get this joke on every single blog in the world. Theoretically, this will create a pyramid of millions of link chains - any one of which can be followed back to the joke's original source. Copyright law itself creates strong incentives for copyfraud. The Copyright Act provides for no civil penalty for falsely claiming ownership of public domain materials. There is also no remedy under the Act for individuals who wrongly refrain from legal copying or who make payment for permission to copy something they are in fact entitled to use for free. While falsely claiming copyright is technically a criminal offence under the Act, prosecutions are extremely rare. These circumstances have produced fraud on an untold scale, with millions of works in the public domain deemed copyrighted, and countless dollars paid out every year in licensing fees to make copies that could be made for free. Copyfraud stifles valid forms of reproduction and undermines free speech. This is powerful stuff that every consumer, creator, educator and politician needs to be aware of. .... "is somewhat of a scavenger hunt. Everyone has their own holiday traditions and any tradition can be seen differently from one person to the next. TackyChristmasYards.com is not a malicious attempt to end all decoration, just a fun challenge to find the most violations. Locating the “best” yard is as much of an art as creating the “best” yard." On being told that someone has bought a new car women usually ask what colour it is - men ask what sort is it. Men like to have all their stuff (DVDs, CDs, etc) on show to impress their mates. Women like to hide things in cupboards. We all go on about our 'rock n roll', but these two guys rock the house! It's nice to hear an ethnic piece of music that displays great talent outside of our normal North American sphere of entertainment. Are ya still 'ba-da-ba-ba-ba lovin' it'? 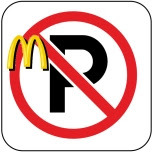 Overstay your welcome (more than 45 minutes) at a McDonald's parking lot in the UK and receive a 125 Pound ($258CAD) fine in the mail. Here's a cute parody on the typical herbal shampoo commercial, starring Canadian Shaun Majumder. 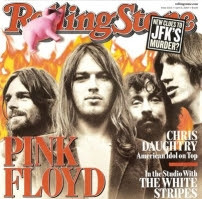 I scored 31 on the Almost Impossible Rock Quiz. I did not cheat at all - I tried to answer the questions purely from memory. If you think you know the history of music, give it a spin. 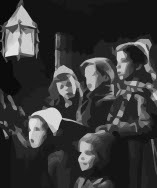 Here's an event I'd like to see come to Calgary - Unsilent Night. The idea is that a large group of ghetto blaster toting folks show up at a specific place and stroll through town playing the same holiday music (it's all finely synchronized). Remember the post I did a little while back about the 2 cats talking? Well, someone overdubbed what they would sound like if you could understand 'cat'. Perhaps one of the most unfortunate book titles - ever. I just can't stop laughing. Is it an 'attack' on one belief if you profess a belief in something else? Sounds bizarre, doesn't it. Yet that's what some people are proclaiming after an atheist group put up a sign to mark the winter solstice with the words, "Imagine no religion". Muslims and Christians alike are upset, especially at the suggestion (as portrayed in the sign) that 9/11 wouldn't have happened if it weren't for religion. "Lane reversal in effect Mon-Fri 15:30-18:30. Expect delays." A most awesome slide show explaining what the DMCA is all about (and why we should be making a big deal about it). Very nicely done.